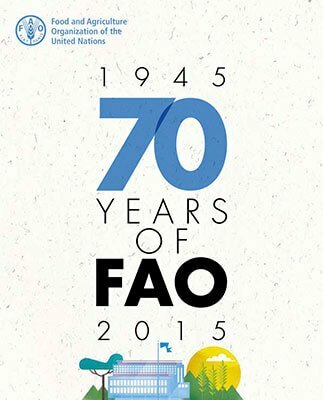 This book tells the story of these seven decades of the history of FAO, its protagonists and their endeavours. We have dug into the FAO archives to bring to light unpublished black and white images, which form a portfolio of evocative images of the early years of the Organization. The book is also a record of the Organization’s 10 success stories, for example, the eradication of bovine rinderpest; the Treaty on Plant Genetic Resources, a vital agreement to ensure the planet’s biodiversity, and the Code of Conduct for Responsible Fisheries, which is essential for the conservation of the marine ecosystem. The most important challenges facing FAO in the coming years are also discussed and summarized into two main themes: the eradication of hunger and malnutrition and what action we take to combat climate change. The publication brings the reader on a journey through the regional offices of FAO to look at its regional initiatives. As a neutral forum hosting numerous conferences and meetings every year, we wanted to open the doors of the FAO headquarters in Rome so that you could discover every corner in a virtual tour where we showcase the different rooms. This is, in short, a book for everyone, designed in an attractive way and written in simple language that is easily understood.